The Satake Moisture Control System SWMC is a reliable and cost effective way of controlling the addition of water to wheat during the tempering process. 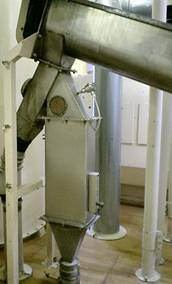 Using modular components, it is straightforward to install a fully integrated feedback control system in your own wheat mill. The Moisture Sensing Unit measures both the moisture content of the wheat and the temperature of the product. It is normally installed in a spout after the Tempering Mixer or SHD Hydrator, but can be positioned at any point either horizontally or vertically providing that it runs in full contact with the wheat. The Water Panel controls and monitors the flow rate of water using all electronic components. The control PC connects into the terminal box and sends the target flow rate to the SWEC. The SWEC returns the actual flow valve position to the PC. 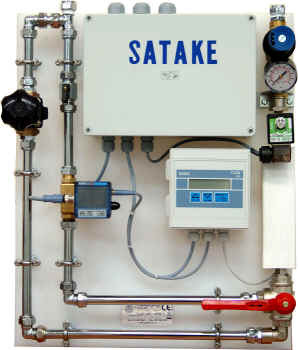 Satake’s MoistureONE PC based control application allows the operator to manage all of the system functions from a single main screen. For easy operation in a potentially dusty environment, all main operations are set using the touch screen panel. - Product Name Setting: The mill can assign a different product name to each wheat variety or grist that they mill. - Product Target Moisture Percentage: The desired moisture value for the conditioned wheat in percent. - Valve Start Position: The immediate position of the water valve on start-up. This allows for initial anomalies such as dry spots and unstable flow to be compensated. - Maximum Water Valve Position: The maximum allowed position for the water valve as a percentage of full scale. The common parameters and levels are displayed on the touch screen panel and also recorded on the PC’s hard disc for trend analysis and quality control purposes.